Each Patriotic Degree Knight of Columbus may choose to have a chalice presented to a priest or bishop. The Sir Knight’s name is engraved on the bottom of the chalice. 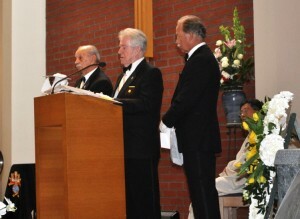 A Chalice Ceremony is conducted during the funeral Mass of the Sir Knight. Each time Mass is celebrated with the chalice, the Sir Knight is remembered in prayers. On October 31, 2008, Bishop Tod Brown of the Diocese of Orange presented an Assembly chalice to Patriarch Twan. Bishop Brown had led a pilgrimage to the Holy Land. Rev. John Janze, Faithful Friar of El Camino Real presented a chalice to the Latin Patriarch-November 2010. 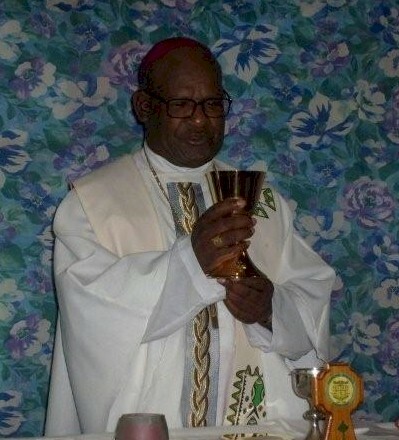 Bishop Otto Separi, auxiliary bishop of Papua New Guinea celebrated Mass on December 1, 2008 with a memorial chalice given to him. The chalice was presented to the bishop by Brother Peter Ryan, FSP, Vicar General of the Patrician Brothers. Bishop Otto is the first PNG born bishop of Aitape, and he pledged to remember the Sir Knight and his family each time he uses the chalice. The bishop said he felt privileged to be chosen to receive the chalice and asked that his thanks be conveyed to the Knights.